THE MAN WHO brought the MTV Music Awards to Belfast plans to turn Mayo’s Westport House and estate into a major concert venue. 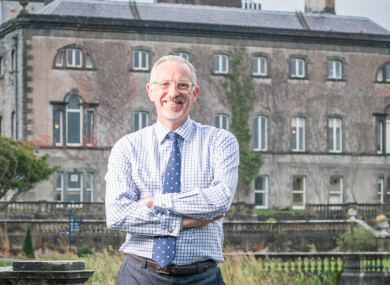 Tim Husbands, who recently left Titanic Belfast to head up the Hughes Group-owned Westport House and Hotel Westport, says the 400-acre site could fill a gap in north-west Ireland, which lacks a big-ticket events space. “There was a country music concert by Aiken Promotions here the summer just gone. We’re talking to all the major event organisers about what could be done. We’re obviously talking to authorities about what kind of capacities we can work with,” he tells Fora. Before moving to Mayo, Husbands spent 23 years in Belfast, where he worked as managing director of the city’s Waterfront and Ulster Hall venues. While he was head of city events and venues at Belfast City Council, Husbands helped bring the 2009 Tall Ships Festival and 2011 MTV Music Awards to the city. He left the public sector to become CEO of Titanic Belfast when it launched in 2012. Under his watch, it grew into a multimillion-pound attraction that has hosted four million visitors since opening. Queen Elizabeth II visited – “that was a real privilege” – and Husbands was awarded an MBE in 2014 in recognition of his contribution to the regeneration of the Titanic Quarter. In 2016, the attraction fended off the likes of the Colosseum and Eiffel Tower to be named the world’s leading tourist attraction at the World Travel Awards. It was at that point that Husbands thought about “doing something a little bit different”. Late last year, brothers Cathal, Owen and Harry Hughes – who bought the famous Westport House and estate for an undisclosed sum in January 2017 – hired Husbands to lead the attraction and their existing Hotel Westport. When asked what attracted him to the role, Husbands says: “I was very impressed by the vision that the Hughes family explained to me about what they wanted to do with the property, what they wanted to do with the destination. The hotel is due to undergo a major refurbishment that will see it double in size with 80 new rooms. However, Husbands says it’s still another three years before he turns the key on the extension: the development is still at the concept-design stage and has yet to go through the planning process. The Hughes brothers plan to re-position Hotel Westport as a ‘four-plus’ hotel, straddling between the four- and five-star grades. “There are a lot of four-star properties in the area, and we’d like to just try to create more of an edge around it. That’ll be a combination of the way that we service our customers, but also the products that we’re looking at,” Husbands says. It’s hoped that the hotel, estate and house will become more closely aligned to create a single destination, which Husbands believes could be pitched to conferences and the high-end wedding market. “Westport House is a fantastic heritage piece and has the opportunity to create a unique offering,” he says. However, Husbands notes that the resort will require “a lot of TLC” and significant investment – the Hughes have already suggested they will put €50 million into the project. “We think there’s an awful lot of work to do. We’ll be looking at a programme of work over the course of the next five to 10 years,” Husbands says. In terms of short-term plans, Husbands says work will begin on revamping Westport House itself over the next 18 months. Husbands says its previous owners, the Browne family, “did a fantastic job in retaining the house over the last 400 years”, but the centuries-old property requires “modernisation” to help bring it in line with visitor expectations. “I think there are more modern ways in which we can tell the story (of the house). I want it to become a much more immersive experience and connect up the house with the estate because they’re kind of positioned as two separate things right now. “I think you’ll see walking tours and walking activities integrated with the house. And we’re looking at virtual reality and augmented reality for how we tell the story of the individuals in the house. The Hughes brothers hope to bring one million tourists each year to Westport House and estate – an ambitious task considering it attracted just over 162,000 paying customers in 2014. Husbands is confident he will hit that target but says one of the main challenges facing the estate is poor transport infrastructure. However Husbands says poor road connections are hindering Westport from attracting more visitors from Northern Ireland, a key market. “Northern Ireland people are excited about coming to Westport and the west coast of Ireland – they have a sense of nostalgia about it, which is a real strength. Husbands expects Mayo County Council will improve the roads around Castlebar and Westport within the next three years “which will no doubt help”, but he also thinks the state-backed tourism agencies need to entice more international visitors northward, particularly those on the Wild Atlantic Way. “I think Fáilte Ireland and Tourism Ireland have a responsibility to look at the ways in which they’ve invested wisely in the branding and the opportunities around the Wild Atlantic Way and to look at the regional benefit north of Galway,” he says. Email “Westport House's new boss plans to turn the iconic estate into a major concert venue”. Feedback on “Westport House's new boss plans to turn the iconic estate into a major concert venue”.